Victoria says Brittany has talked to Caleb and told him to put Devin up. Joey tells her why she wants everyone to talk to Caleb. He’s making it out that the replacement nominee is a house decision so she wants everyone to know that. Brittany is worried because she told Joey about Caleb asking the house about the nominee and making it a house decision. Brittany doesn’t want it to come back to her and causing trouble. Joey reassure her that she’s heard it from other people names Devin. Frankie leaves Derrick comes up. Derrick say this explains Joey’s announcement. They agree Joey is going to explode. Derrick is going to tell Caleb to do whatever he wants and Derrick is going to support him. Derrick doesn’t think what Joey is doing is helping her game it puts a target on her back. Derrick suggests she does the same not tell Caleb a name. Joey understand she did try to start a girls alliance so that is a good reason to put her up. 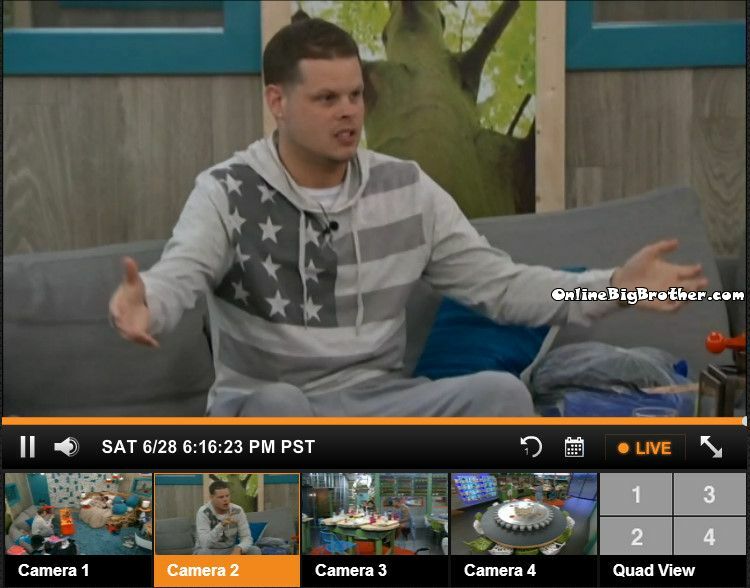 Derrick mentions how early in the game HOH’s don’t have many reasons to put people up. Derrick thinks Caleb will honour it Derrick think it will be a house decision. Victoria says Brittany talked to Caleb and told him to put Devin up. They agree they’re too scared to say Devin incase it comes back to them. They agree what Joey did was not a smart move.They think it puts a bigger target on her back. Derrick asks her if she’s cool with Joey. Victoria is cool she thinks everyone in the house is that’s teh problem. Derrick doesn’t know he was making a sandwich at the time. Derrick is going to get a feel for the house and vote with the house. He doesn’t want to vote out “Y” and “X” ends up going home then he’s the target next week. Derrick – “You are a fool to go against the house this early on” Derrick thinks she has a crush on Cody. Victoria is use to dating guys in their 30’s Cody is just a child. Even if Joey’s announcement doesn’t save her, she has people talking about being afraid of Caleb and Devin. That’s the type of thing that grows everyday and may be a game changer in the next few weeks. I like that Joey did make the announcement…it gets people talking (& hopefully thinking)…it also shows that she is out to start the game. Remember though…she’s America’s Choice and is probably having to start ‘something in the house’ (which we don’t get to see until the show airs). Ugh! The first week can be so brutal with all the back and forth, walking on eggshells and just playing it safe. Watching BB After Dark.. I could look at Cody all night! He’s astestically perfect.. & Joey has Beautiful eyes! I like that Joey is fighting to stay in the house and not being all woe is me. I could look at Amber all night! She’s physically attractive! That being said…. yes please keep Blue eyes Joey and send POW POW packing! I really hope Joey doesn’t leave she’s one of the few people i actually don’t mind. i can’t remember a house meeting that ever resulted as intended (including dan’s funeral). i hope it works for joey’s sake, but from all the house talk so far, she’s toast. i wish it weren’t so, but frankie’s right – these are amateur mistakes. joey’s digging herself deeper, as pow pow just sits back and plays nice. there’s no way she’ll stay if she’s up against pow pow. Why is it that as soon as someone speaks the TRUTH they are up and out? I get the “playing the game in fear” mentality as to speaking your mind, but geez, every year one small group of people calls all the shots and others follow like sheep or risk eviction. The sheep have the numbers so why not band together and get the few bullies out? That was Jessie’s thought last year and nobody supported her against that awful Demanda. Then we were forced to watch that witch for another 4 weeks! Go after Caleb, Devin, Amber, Frankie and Zach now! !